On Saturday afternoon two days ago, Matt Perrins sat down at 5pm and played his first ever hand of Deuce to Seven No Limit having watched roughly half an hour's worth of YouTube videos on the game. 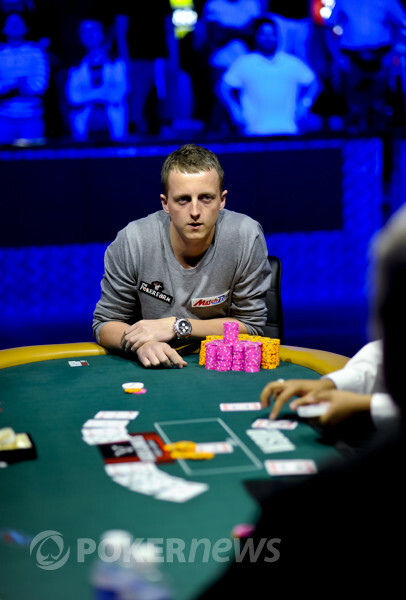 Two days later he has now been crowned a WSOP bracelet winner, beating a field of 275 to join his best friend Jake Cody as the second UK player to win a WSOP bracelet this year. Perrins admitted after that he hadn't been initially sure of what he was doing in the early levels but gradually picked up the game and its similarities to Hold'em. He also said he knew that everyone else was much more experienced than him and he attempted to make it up by consistent aggression to build his stack. He also stated his intent to now play the $10,000 2-7 NL later on the series, something he said he would only have done if he cashed for $10,000 or more. Congratulations to Matt Perrins, winner of Event #9 at his very first WSOP and look out tonight Las Vegas. The Brits will be out to celebrate this one! Matt Perrins is the New Champion! Matt Perrins had never even played 2-7 Draw Lowball before four days ago. 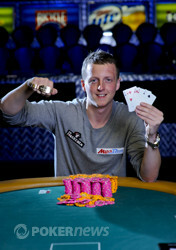 Now, he is $102,105 richer and has a WSOP bracelet of his very own. Sarah Grant chatted with him about his victory. Matt Perrins bests Chris Bjorin for a bracelet. Perrins moved all in from the button for 1,150,000 and after a bit of tanking, Bjorin made the call and both elected to draw one. Bjorin then said, "Can you draw first so I know what I have to beat?.. I might be drawing dead." 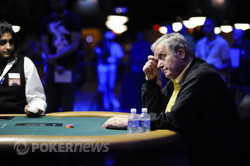 Perrins did so and drew the nut card with a . Bjorin drew a meaningless and Perrins took down the bracelet and $102,105. Most hands have been raise, fold, but we finally got a draw. Perrins raised to 24,000 from the button and was called by Bjorin in the big blind. Both drew 2. After the draw, Perrins bet 35,000 and Bjorin called. Perrins showed that the draw served him well when he threw down to take down the pot. 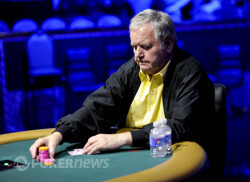 Chris Bjorin raised to 24,000 but then had to fold when Matt Perrins set him all in. Next hand saw Perrins raise to 24,000 and Bjorin called. Both players drew two cards and it went check-check. Bjorin showed a super strong , which was more than enough for the pot. 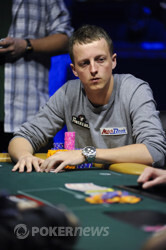 Perrins then got a walk before winning the next hand too with another raise to 24,000. Matt Perrins raised to 24,000 and Chris Bjorin called before taking two cards. Perrins stood pat, and Bjorin checked, then folded when the Brit bet 23,000. This elicited a few cheers from the UK crowd who shouted, "Stand Pat Mat!" and "Pat Perrins!" at their friend. Bjorin on the button raised to 24,000, and Perrins re-raised to 64,000, getting a call from Bjorin. Bjorin drew one and Perrins stood pat. After the draw, Perrins bet 73,000 and Bjorin folded. This was the biggest heads-up pot yet, and Bjorin was left with 220,000 while Perrins now has about 1,000,000. It's very tight at the moment and there have been very few draws or showdowns, but Matt Perrins is gradually increasing his lead.